Coffeehouse/Cafe - FOOD - "The Delicious"
If you follow me on any of my social channels, you probably know by now I’m an unapologetic a caffeine addict. My favorite part of the morning is starting with my cup of joe. One of the best gifts I’ve ever gotten was my pour over for my birthday because I use that every single day and it changed the way I look at and drink my coffee (straight up black, no sugar for the record). 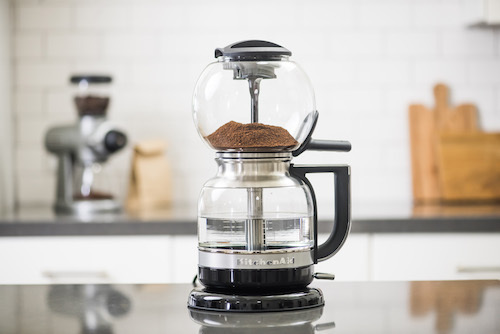 KitchenAid’s Pour Over Coffee Brewer heats and pulses the water, so the grounds bloom and you get the most flavor for your coffee and the push of a button. If you ever tried brewing coffee manually (like I do at home! ), you know that you have to pour water over the grind steadily and slowly to get the best flavor. This does the work for you. This is a different type of brewing method that comes from the vapor pressure pushing the water down the tube. Then a vacuum suction draws the coffee through the grounds. The difference is it extracts a little more distinct flavors from the beans you use. Next level stuff things. Plus, it looks like a conversation piece it itself, no? It brews 2-8 cups of coffee, so perfect if you entertain guests often. Makes a medium-bodied and complex flavor. For the real coffee connoisseur, getting the best grind is an essential part of the process. I always have to go to a shop to get mine done, but this would make it so much easier if I could just do it at home! Using a French press like this one is a convenient way to get a delicious cup of coffee (it has an integrated scale and timer to ensure you get the best brew). Plus it has a sleek stainless steel design that retains heat, and its small size calls for less countertop clutter (another thing my small NYC apartment can use). Makes a bold, full-bodied cup of coffee. 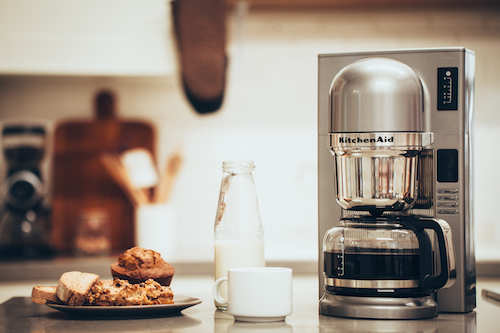 To check out their full line of brewers, visit kitchenaid.com. They have a full line to take your coffee game up a notch or two J. Anyone have a coffee grinder/machine at home? What do you normally use? It is really nice idea. It is the best idea for coffee lovers. I will give the surprise gift of my hubby. He is a great coffee lover. It will be good gift for him, for this Sunday. Thanks for given this idea.